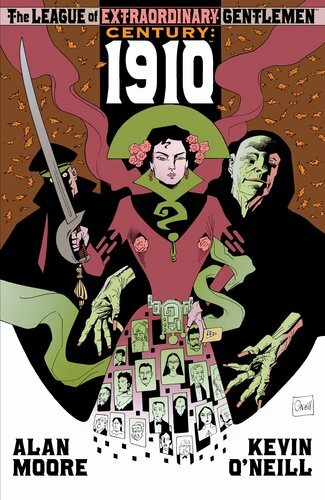 The League of Extraordinary Gentlemen: Century 1910 is the first part of the third volume of Alan Moore's classic comic series about a dysfunctional team of period heroes drawn from literary fiction who work for the British Government. This is the first of three issues that make up the complete arc of volume 3 with each issue set in a different time period (1910, 1969 and 2009). I believe you can buy the complete arc in a single compilation now if you prefer. The twist in The League of Extraordinary Gentlemen series is that fictional characters from famous books are real and all exist together in the same universe. The League has previously included the likes of the Invisible Man and Mr Hyde but in this latest episode - set 12 years after the Martian invasion events of volume 2 - Moore brings in some new characters. In 'Century', Mina Murray and Allan Quatermain return from previous volumes but joining them this time in the League are Raffles (the "gentleman thief"), Carnacki (an "occult detective") and Orlando the gender-bending immortal. The story begins in 1910. Carnacki is plagued by nightmares and visions of a strange cabal of dark magicians, the end of the world, and an attempt to create a 'Moonchild'. He shares these unsettling experiences with the other League members ("I only remember fragments. A sinister cult, a foreign girl swimming naked, someone singing a catchy song...") and Mina suggests his dreams could have something to do with the upcoming coronation of King George V.
The League's chief, Mycroft Holmes, duly orders them to investigate. Meanwhile, a series of bloody murders in London's East End suggests a famous killer is back while Captain Nemo lies close to death on Lincoln Island. Will his estranged daughter Janni agree to his request that she take command of the incredible steampunk submarine Nautilus and continue his work as a pirate? Anyone who found The Black Dossier a little obtuse might enjoy the start of the Century arc more - the wonderfully atmospheric and detailed art by Kevin O'Neill drawing us quickly back into the story. This is highlighted early on when Janni dives into the sea at night with clouds rolling past the moon behind her. The art takes up a whole page and illustrates the care that goes into these comics. I love too the little details of Carnacki's bedroom with mummies and strange specimens in jars surrounding him. This story is set mostly in East London with nice background period detail of docks, chimneys, gas lamps and old cars. The League of Extraordinary Gentlemen is one of those comics where you often find yourself studying the background of panels for the detail and jokes. There is perhaps a little more humour in this chapter than previous ones and the League seems slightly more comfortable and respectful of one another than earlier incarnations. The banter between them is quite amusing at times. We learn that Raffles was blackmailed into the League because of his legendary prowess as a criminal and thief whereas Carnacki volunteered his services out of duty. There is a "but" though. "If my premonitions in London hadn't been so strong I wouldn't be mixed up with you people either..."
It's good fun when Raffles deploys his breaking and entering skills and I enjoyed the League having to visit Carnacki's eccentric club. "The one full of decadents and occultists?" asks Mina. Likewise, the detail and imagination displayed in the depiction of the Nautilis interiors and the League's museum headquarters is very inventive and enjoyable. The tone of the story is dark with plenty of black humour, mysterious occult shenanigans, and a character loosely based on Aleister Crowley. Moore seems to try and get away with a little more each time he returns and this book is somewhat risque at times in a deliberately bawdy way. Orlando, a composite of several different fictional characters, is a rather camp dandy with a dry suggestive wit who claims his sword is the legendary Excalibur. "Oh, hush. This is the blade of England's greatest defender!" He claims to have been at many pivotal and great events throughout history but finds it a pain to be a man currently because he has to shave. Orlando is a fun addition to the League. "All the chaps I dream of are terribly over-familiar," quips Orlando after Carnacki mentions that a figure in his dream was vaguely familiar. Later, told that he has has just uttered his stupidest ever words, Orlando replies, "Oh, I don't know. There was that 'Oh, Look! What a wonderful horse!'... That was at Troy." Perhaps one quibble with this first part is that, understandably, it is setting up the story to come and therefore isn't crammed with action or any resolution. There is no major villain revealed although there is an explosive and bloody climax with a twist of sorts. You don't always quite know what Alan Moore is going on about but that's part of the experience and a mysterious and foreboding atmosphere is generated in the comic at times. One novel note about the first part of Century is the presence of songs based on Brecht and Weill's The Threepenny Opera which foretell parts of the story. Moore also delves into Ripper conspiracy again as Mycroft Holmes seeks a cover-up with an establishment figure linked to the murders. One fascinating character introduced in Century is Mr Norton, a cryptic time traveller who is rooted to the same spot as he travels through time. We see him standing still as different eras morph into or out of place around him as he travels to meet Mina. If you look closely enough you'll spot several guest stars in these panels including William Shakespeare and Marty Feldman! Some of the references and jokes are obscure but it's always enjoyable when you spot one. I did enjoy the bit where someone on the docks mentions that an old "copper" has died. The one that solved the "Moonstone caper". Century is a good purchase if you love Alan Moore or have enjoyed this comic in the past. It's packed with detail and care and suitably complex and amusing. You also get a six page piece of comic prose by Alan Moore at the end of this issue called Minions of the Moon and more fake adverts for period products of the time on the inside cover. Just make sure you get hold of all three parts.